For Santa, December 26th was a horrible, awful day. It was THE WORST DAY OF THE YEAR. Santa gets the post-holiday blues ... When the toys are all made, the presents handed out, the Christmas cookies eaten, and the stockings unhung from the chimney with care ... Santa is miserable. His reindeer and elves can't lift his spirits, and even a vacation with Mrs. Claus doesn't do the trick. Will Santa ever feel like his old holly-jolly self again? This quirky, funny, and completely unique picture book by hot young hipster illustrator Tad Carpenter will appeal to kids and parents alike. 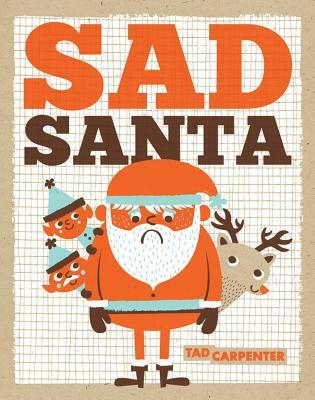 Tad Carpenter is an illustrator, designer, and teacher. He has worked with Macy's, Adobe, Target, MTV, Hallmark Cards, Nick Jr., and Publix, to name a few. He feels very lucky to draw, paint, and create for a living. Tad lives in sunny, snowy, and forever changing Kansas City, MO, with his wife, Jessica, who is also a graphic designer.